Next generation web scanner. Identify the technology stack that powers a website and explore the Web of Things. Most WhatWeb plugins are thorough and recognise a range of cues from subtle to obvious. For example, most WordPress websites can be identified by the meta HTML tag, e.g. ”, but a minority of WordPress websites remove this identifying tag but this does not thwart WhatWeb. The WordPress WhatWeb plugin has over 15 tests, which include checking the favicon, default installation files, login pages, and checking for “/wp-content/” within relative links. Using a higher aggression level to identify the version of Joomla in use. –log-errors=FILE Log errors. This is usually printed to the screen in red. All plugins are loaded by default. Plugins can be selected by directories, files or plugin names as a comma delimited list with the -p or –plugin command line option. Each list item may have a modifier: + adds to the full set, – removes from the full set and no modifier overrides the defaults. The –dorks <plugin name> command line option returns google dorks for the selected plugin. For example, –dorks wordpress returns “is proudly powered by WordPress”. The –grep, -g command line option searches the target page for the selected string and returns a match in a plugin called Grep if it is found. WhatWeb features several levels of aggression. By default the aggression level is set to 1 (stealthy) which sends a single HTTP GET request and also follows redirects. –aggression, -a 1. Stealthy Makes one HTTP request per target. Also follows redirects. 2. Unused 3. Aggressive Can make a handful of HTTP requests per target. This triggers aggressive plugins for targets only when those plugins are identified with a level 1 request first. 4. Heavy Makes a lot of HTTP requests per target. Aggressive tests from all plugins are used for all URLs. Level 3 aggressive plugins will guess more URLs and perform actions that are potentially unsuitable without permission. 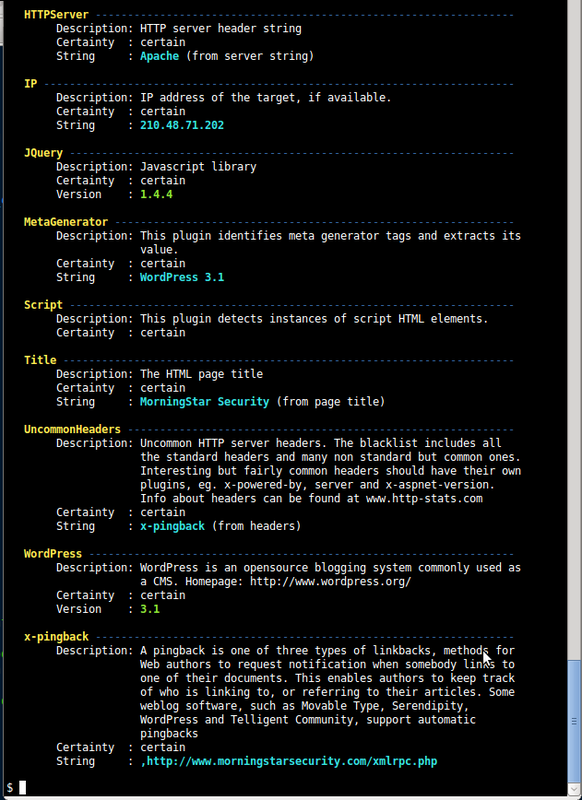 WhatWeb currently does not support any intrusion/exploit level tests in plugins. Note the use of the -p argument to select only the phpBB plugin. It is advisable, but not mandatory, to select a specific plugin when attempting to fingerprint software versions in aggressive mode. This approach is far more stealthy as it will limit the number of requests. WhatWeb has no caching so if you use aggressive plugins on redirecting URLs you may fetch the same files multiple times. The –wait and –max-threads commands can be used to assist in IDS evasion. Changing the user-agent using the -U or –user-agent command line option will avoid the Snort IDS rule for WhatWeb.